I've never had the opportunity to smoke a Davidoff cigar until now. If you read my post on Thursday, you know I won a Davidoff No. 6 humidor in a #VivaDavidoff contest. 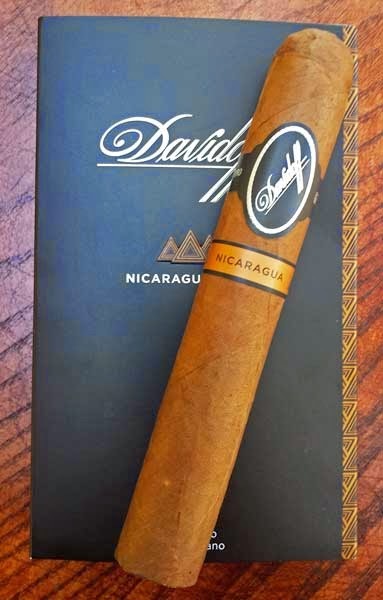 With the humidor Davidoff included a four-pack of Davidoff Nicaragua Toro Cigars. Construction of this Nicaragua Toro is first class all the way. The oily Colorado Claro colored Rosado wrapper is rolled on with seamless care and it's virtually vein free. Beautiful. Checking the body, it's packed firmly full length with no hard or soft areas and there's a nice triple cap. From the cold foot there are notes of sweet fermented tobacco to the nose and the free draws tastes of spicy cedar. Once the foot was toasted and burning the first puffs produced large mouthfuls of mild/medium bodied smoke tasting like sweetened cedar. As the sharp burn line moved up the body there were other notes of leather, white pepper, oak, brown sugar and toasted nuts. After eighty-five minutes the cigar finished in the medium/full range with flavors of mild black pepper and sweet caramel. Since this was my first Davidoff cigar, I didn't know what I'd find, but this cigar was pretty nice. It had a great burn time, solid flavors and top of the line construction. I'm sure in the future I'll be trying more Davidoff blends!